It always surprised me that for how easy they are to make, my mom never made Rice Krispie Treats for me when I was a kid. She is kind of dangerous around melting marshmallows so that might be the reason. 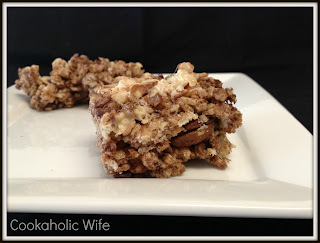 I’ve made the standard Rice Krispie treats before, but never thought to add anything else into them. Luckily, others have, because these Rice Krispie treats were super tasty. I love Rocky Road ice cream so I figured these would be good, but they were much, much better than anticipated. 1. Spray a 9×13 baking dish with non-stick and set aside. 2. In a medium saucepan over low heat, partially melt the butter. Then stir in the bag of marshmallows and the cocoa powder. Once melted, remove from the heat. 3. Stir in the Rice Krispies until they are evenly coated in the mixture. Then quickly stir in the remaining 2 cups of marshmallows, nuts and mini chocolate chips. 4. Pour into the prepared dish and spread out evenly. Refrigerate for at least 30 minutes or until set. Cut into 24 bars and serve. The bag of what I thought were chopped walnuts were actually pecans, so I decided to just go with it. I found that the easiest way to stir the marshmallows and the cereal is to spray a rubber spatula with non-stick spray. I didn’t even notice that the recipe called for almond butter until it was too late, so I opted to just leave it out. I don’t think it made a difference at all. We gobbled these up quite quickly and I was planning on making a second batch when I realized that Tom ate the rest of the cereal. I swear, I can’t leave cereal unattended in this house, ever! 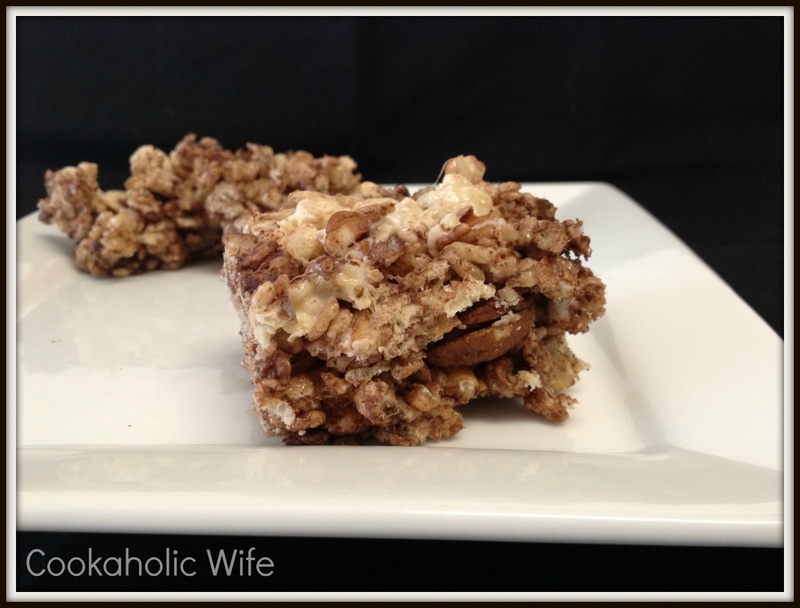 Oooh – I have some rice krispie cereal I could use to make this! Thanks for sharing!